1855 To Pickle Walnuts. Make a brine of salt and water. 1/4 lb of salt to 1 Quart of water, put the walnuts into this to soak for a week, put them into a stew-pan with such brine and give them a gentle simmer, put them on a Seive to drain, then lay them on a Fish Plate and let them stand in the Air till they turn black, put them into Glass or unglazed stone Jars fill these about three parts with the walnuts, and fill up with the following Pickle, To each quart of the strongest Vinegar put 2 oz of black Pepper. 1 oz Ginger, same of Eschalots, same of Salt,1/2 oz of Allspice, and 1/2 Drachm Cayenne, put them into a stone Jar, Cover it with a bladder wetted with the pickle, tie over that same [Leather? 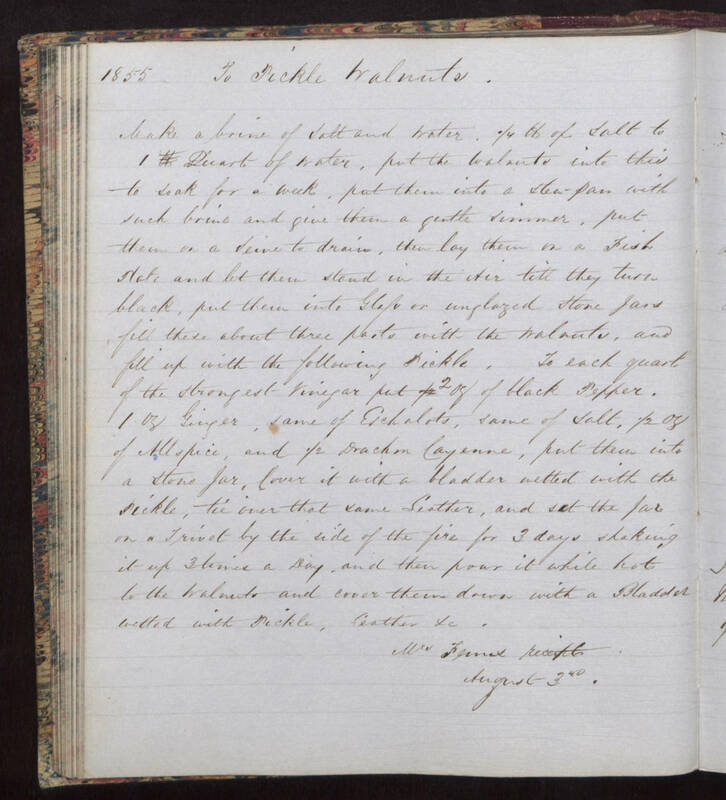 ], and set the Jar on a Trivet by the side of the fire for 3 days shaking it up 3 times a Day, and then pour it while hot to the Walnuts and cover them down with a Bladder wetted with Pickle, [leather?] &c. Mrs Fenns receipt. August 3rd.